Will Smith bounds into the room like he really enjoys doing all these press conferences or something--full of energy, laughing at every joke (including his own), teasing members of the press relentlessly and then laughing even more loudly when we give it back to him. He’s striking presence in the room--tall, muscular, perfect skin and deeply thoughtful eyes, chatty and engaging, lucid and thoughtful. And he’s so down-to-earth that within seconds you forget you’re in the presence of one of the most successful movie and TV stars working today. And an Oscar-nominated one at that. He starts out by challenging the press to a whistling contest, then looking dejected by one guy’s attempt before deafening us with a high-pitched shrieker. Alex Proyas just watched amused, which pretty much defines his entire role in this press encounter. Will Smith: I'm very happy with it. I'm more happy with the fact that I feel we made a great movie. I've had big box-office in the past with not-so-great movies and that doesn't feel nice. The names sort of escape me right now! But to be confident in the film and the powerful, intellectual base that Isaac Asimov set forth with the shorts, and the great visionary future that Alex put together, and some of the greatest special effects you've ever seen -- and me naked -- I think the film just has a lot to offer. Smith: Actually, it's really bizarre and awkward. You just want as few people there as possible. but we brought people in. We had a studio audience! And it was really important character nakedness -- it wasn't gratuitous Hollywood nekkidness. The character suffered from a psychological condition called survivor's guilt. One of the symptoms is paranoia, which is why he had the door open, there's no shower curtain, he doesn't wash his hair because he needs his eyes to be open. So it was deep nakedness! Smith: I guess Star Wars was the movie. I might have been 8 or 9 and that really put me into a space where the sci-fi element was almost a spiritual connection for me -- that someone could imagine that and put it on the screen and make me feel like that. Over my entire career, I've been trying to make people feel like Star Wars made me feel in that movie theatre. Smith: Every time you create and put something out in the world, you have to expect that some things are gonna be great, some things are gonna be not so great. Probably Bad Boys II is the most pain I've ever experienced in my career, because I feel like the better movie was inside of the movie that we had -- like if you take 25 minutes out of the movie and get it under two hours. There were things that were just gratuitous. The reverse for me is a film like Wild Wild West where we just missed -- a swing and a miss. Bad Boys is much more painful to me, because I feel I have a relationship with the audience where I will strive for quality. That's sort of what I have with my fans. I don't make movies for money, I make them as something I would like to see, and something I want the audience to be able to see, so for me it's more painful, the quality let-down rather than the box-office let-down. Smith: Generally, the type of films I made -- the summer films at least -- are virtually review-proof. I don't think I've ever got a good review on one of the summer films. Siskel and Ebert actually gave Independence Day four thumbs down! They reviewed it before it came out and gave it two thumbs down, then the movie came out and was so successful that they said, “We'll review it again, maybe we missed something.” They watched it again and gave it two thumbs down! So from the beginning of my career, I'm used to that. But a more important film like Ali or Six Degrees of Separation, I desperately need you to stop writing bad things about me! Smith: I'm not really a retro guy, I'm a future guy. Most of my interaction with the past, or if I'm studying the past, is always to get a sense of what the future is gonna be. So no old sneakers! My old Technics 1200 turntable is pretty much the only thing that I have musically that's old. I'm completely into my computer, I-Pod, new music programmes, touch screen remotes, all that type of stuff. But I loved the Stevie Wonder music in the film -- that was a personal choice. Smith: We've had thousands of discussions. Alex is an art film director; he cringes at the mainstream concept. We talked about the idea of Bridget and me kissing at the end of the film. The film that Alex created is just beautifully artistic to me. My favourite scene is Sonny and I in the interrogation room. I love its humanity. His direction to me was that I was a racist sheriff who'd just captured the person I am most racist against. Wow! I wasn't used to getting that kind of direction in a big summer blockbuster. "No, I'm fine Alex, just let me do me!" His approach is so artistic, so not a special-effects blockbuster approach. Alex Proyas: I don’t see this as a bleak future. I embrace technology as long as it’s used intelligently. Science fiction allows us to think about it, and especially to think about how we use it. Smith: I think the concept of the Isaac Asimov paradigm that he set off with the three laws is essentially that there's nothing wrong with the technology. The technology is absolutely fine, and the robots are doing exactly what they've been programmed to do. The problem is more man's arrogance in thinking that we can confine the universe to laws. But this harsh adherence to logic, and rejecting our intuition, is only going to leave us in the situation we see in I, Robot. It's more an indictment of human logic than an indictment of technology. I think the concept of technology is that we will have the lower intellectual endeavours taken care of by robots or computers, which will free man up and actually give us more time to read books and more time to evolve. Smith: If you look at the technology of the last 50 years, it's actually advanced as a rate equal to the last thousand years. With the discovery of the microchip in the 1950s, technology is expanding exponentially. So I actually believe that the future we see in the film -- the robotic technology, the electro-magnetic cars -- may not even be 30 years in the future. I think we could be much closer to that. The robotic technology exists, and we studied it for the film. They have cameras in the States in some 7-Elevens that are programmed with body language. The camera can determine if someone is stealing through their body language. Now is that just a cool camera, or is that artificial intelligence? At some point, the camera is going to be a better judge of who's stealing than a person. The technology is there, it's just a matter of pooling it into one piece of hardware. Really, I think the absolute perfect use of a robot would be a golf caddy. I play a lot of golf but I'm really just not good. If you had a robot that could tell you the exact distance to the hole, and what the wind was doing, I'd probably still be bad, but I'd have a robot! Smith: The chicks dig Artoo -- if you want to hang out with the dude, and you're drinking, you've gotta go with Artoo. Smith: [laughs] I resent that question! What we saw in this film is exactly the opposite. The performance of Sonny in this film is Alan Tudyk's -- it's all of the body language, the eyes, the facial motions, the voice, everything is Alan's performance. You are watching the choices of an actor that were adapted by the special effects people, and that cannot be generated. People go to the movies to see and feel humanity, and at this point you cannot computer-generate humanity. Proyas: Sonny looks different. But he’s still Alan Tudyk, an actor portraying the character. Smith: I think I was always an actor that was rapping. The music that I made was always very theatrical. And with the videos I was making, Quincy Jones noticed. He essentially said to me, “You're already doing it, I need you to meet some people for The Fresh Prince of Bel-Air.” Television was a really good training ground to work fast, and having the opportunity to move into films was a really gradual process. Six Degrees of Separation was the first real roll of the dice on everything, but up till then it was a really slow building and learning process. And I'd never had to do anything for money. I think that's what really gave me the opportunity to make the right choices. When people start offering you money, I think that throws a lot of people off. You find yourself in a lot of situations that may not be the right situation, because you need to get paid. Smith: The big issue with the racial elements of Hollywood now -- you have presidents of studios and 90 percent of the staff are Caucasian, so they're gonna make stories that are close to their hearts. So the roles that are created, the scripts they're creating, all of the things they're trying to build for their studio are going to reflect their experiences. 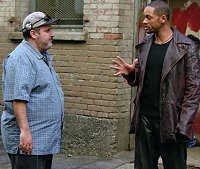 So once Will Smith or Denzel or Halle Berry shows another road or angle, that’s when it comes onto the edge of the studio radar. But until that point, you shouldn't expect an American from New York to make a wonderful story about someone from Ireland. It's not within the experience. So it's more an issue for actors and writers and directors. Smith: I did a romantic comedy coming out in a few months, and I even ran in that film! It's important to me to look good running, because I don't want to be the old dude doing the old run. You make that one action movie too many. [Does the old man run around the room and ends up gasping for breath in the corner] I'm going to make action movies right up till that point.